The kit containing our two top models, the NFA1000 and the HFE59B. This set consists of our two top models, the NFA1000 and the HFE59B. The quasiisotropic antenna of the HF-device has special advantages for the building biology emission measurements, the identification of so-called hot spots, and additionally extends the analyzed frequency range down to 27 MHz. It therefore also includes the TV- and radio-frequencies, as well as the TETRA standards which are to be introduced all over Europe. The NFA1000 with its 3D sensors for E & M, FFT analysis, and data logger is definitely a convincing instrument. Due to its extra broad frequency response, this basic device is predestined for an extension with the UBB27 and for detailed, professional analyses. Its functions and features are tailored to the needs and practical experiences of the building biology. 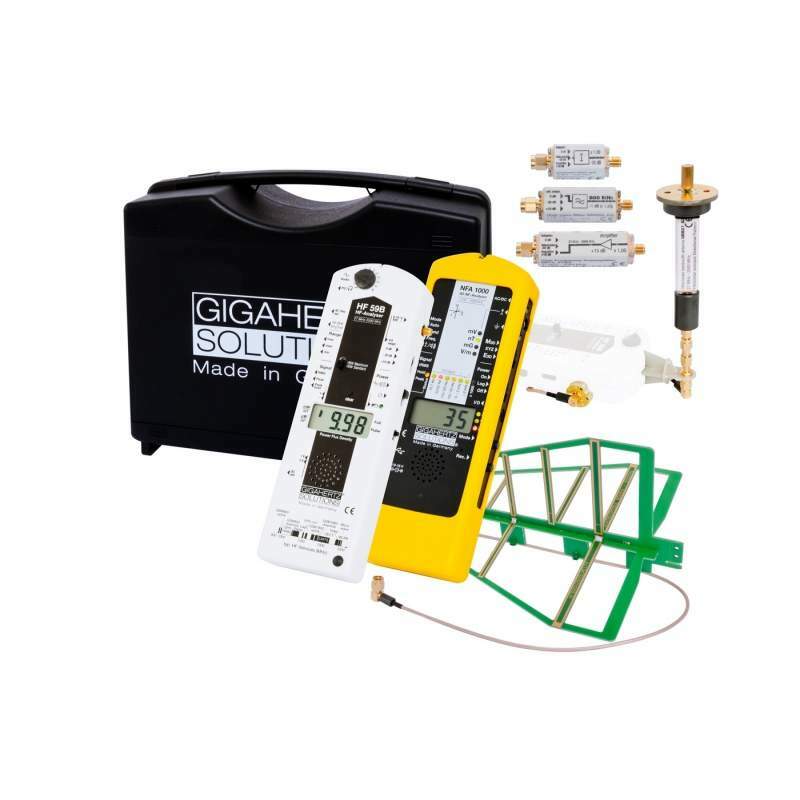 Due to its comparably low price, it is often also used for scientific and industrial purposes - mostly as kit called HF E 59B - especially in the sector of EMVU and product development (precompliance). 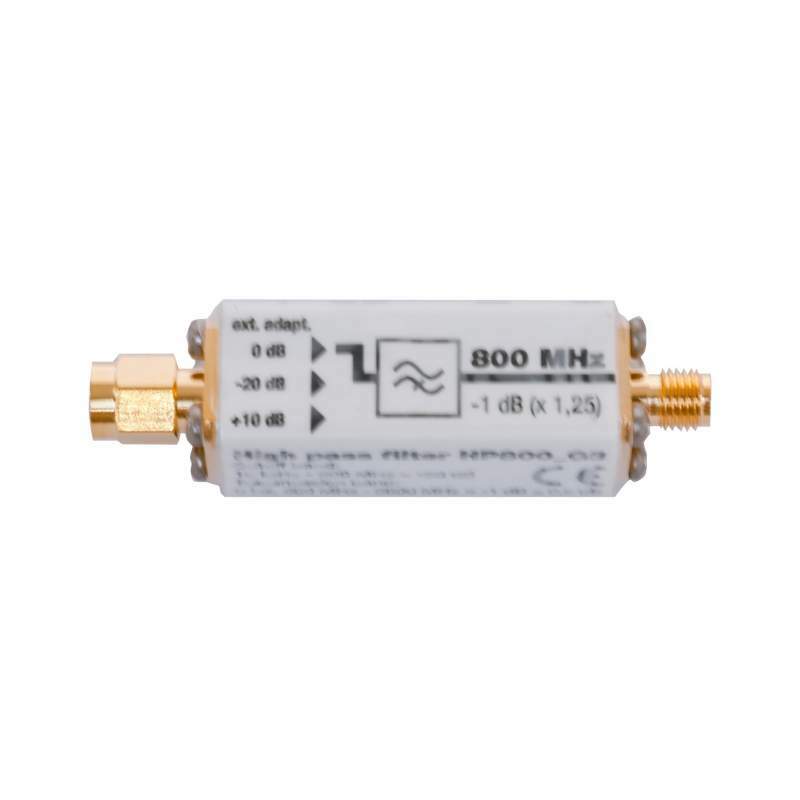 A frequency range of down to 27 MHz within the basic device - suitable for the connection of the optionally available antenna UBB27_G3 (the scope of delivery includes a compensated antenna for 800 MHz up to 2.7 or 3.3 GHz). A calibrated extra AC-measurement output for the demodulated signal, and a scalable DC-output. reducible to 400 KHz for TCO measurements. Please have a look at the data sheet (to be found under "available downloads") for detailed descriptions of the broad performance range of this meter, also in comparison to the other NFAs. 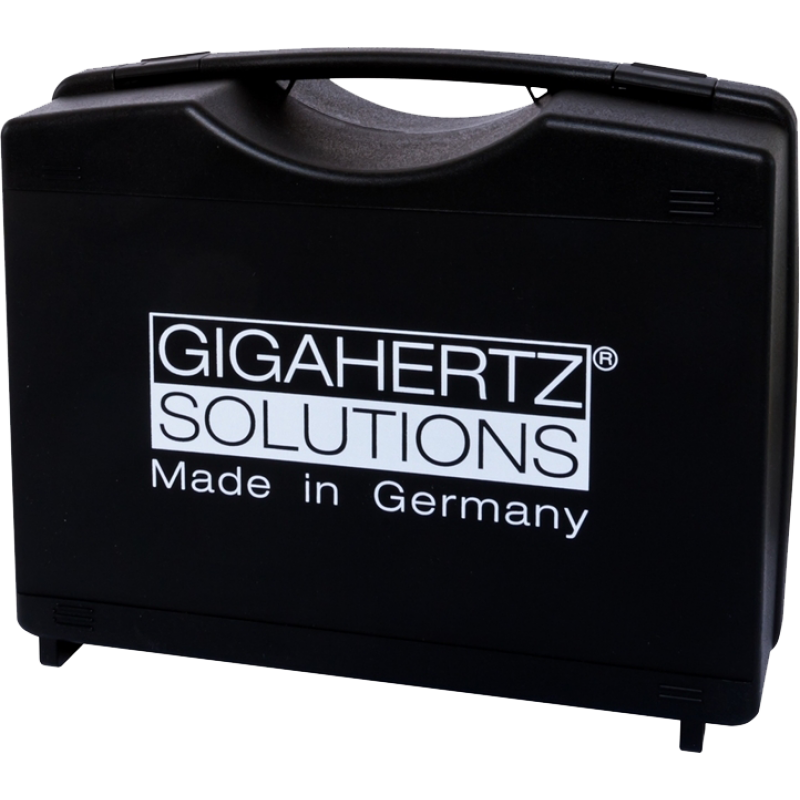 Please find the most current version of the firmware under "Downloads" at the top right of the Gigahertz-Solutions site. 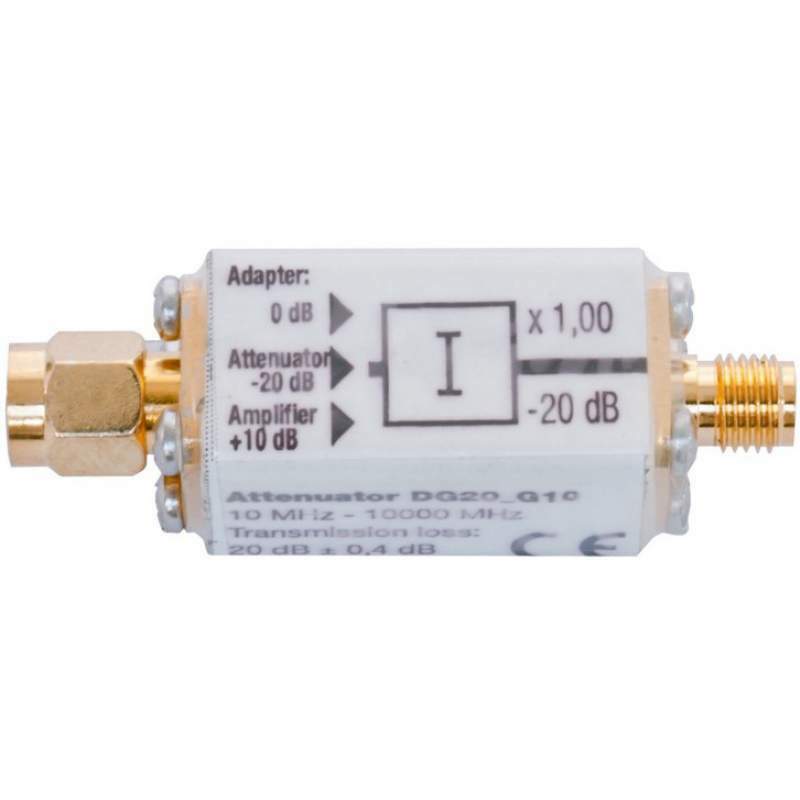 Attenuator with DC-Bypass DG20_G10: For the measurement of increased power flux densities (up to a factor of 100). 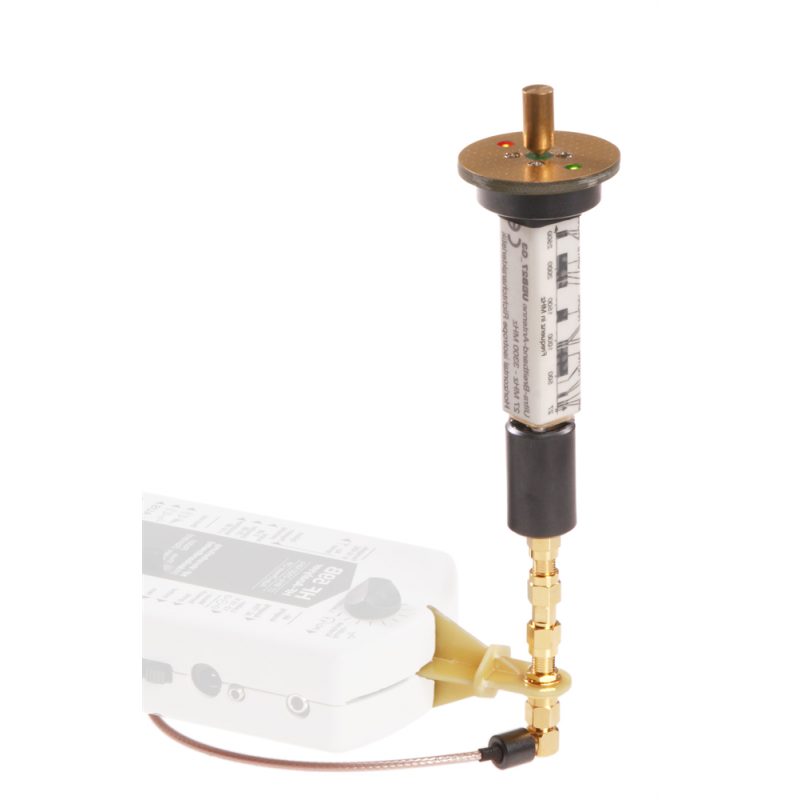 Ultra broadband antenna for RF-Analysers UBB27_G3: The outstanding parameters with regard to the frequency linearity and the responsitivity render this antenna a very useful equipment for broadband measuring devices for the definition of the total exposure to high frequency radiation. Frequency range: 27 MHz to beyond 3.3 GHz. 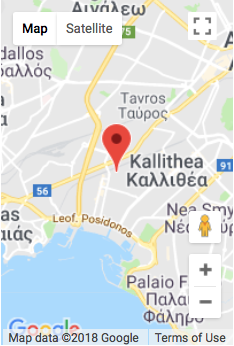 From 27 MHz to beyond 3.3 GHz*: For the measurement of the primary high frequency ranges: CB and amateur radio, directional radio, TV and radio (digital and analogue), TETRA, GSM, radar, DECT, UMTS, WLAN, and more. "Overall (non-directional) reception": Horizontal isotropic directional pattern - a fundamental feature for long-term measurements. Compact construction: Identifies so-called "hot spots". To be attached directly onto the HFE35C or the HF59B. * Limited in real terms by the frequency response and specifications of the respective HF analyzer. 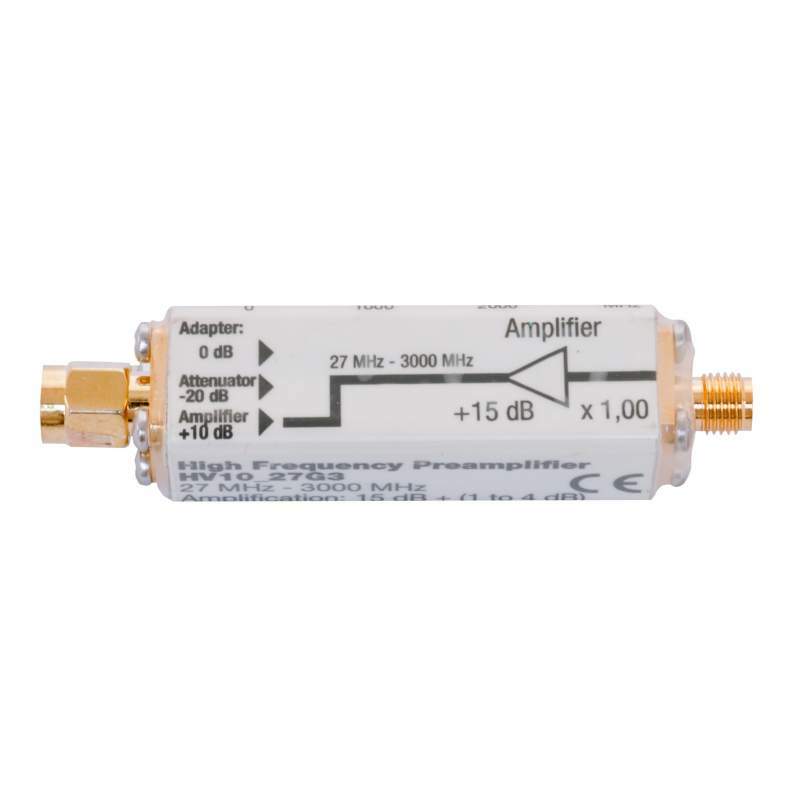 RF-preamplifier HV10_27G3: Increases the sensitivity of the HF-analyser by a factor of 10 (= 10 dB), that is nominal 0.001 µW/m²*. 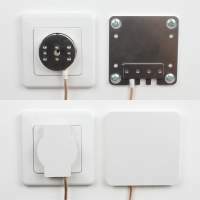 Adapter plug to be connected to the antenna input socket, remote-fed by the respective basic device. 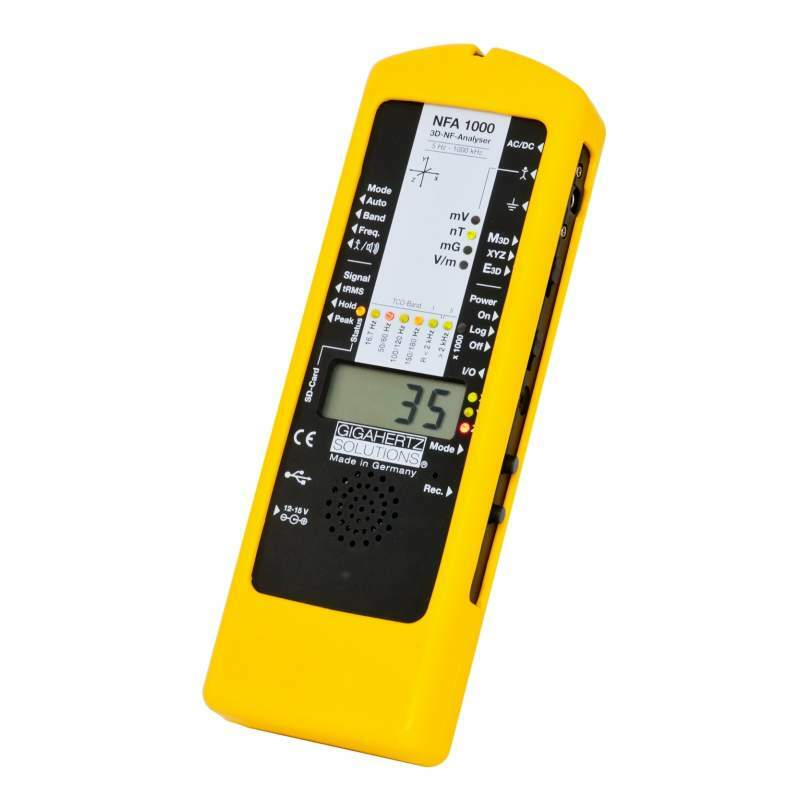 It is especially recommended for the HF59B for measurements in the highly sensitive measuring range of the radar and UMTS mode. Future-proof: Comprises the full frequency range of the HF59B. In order to avoid measurement errors due to intermodulations, a high pass filter matching to the antenna (such as the HP800) should be applied when measuring with the log.-per. antenna. 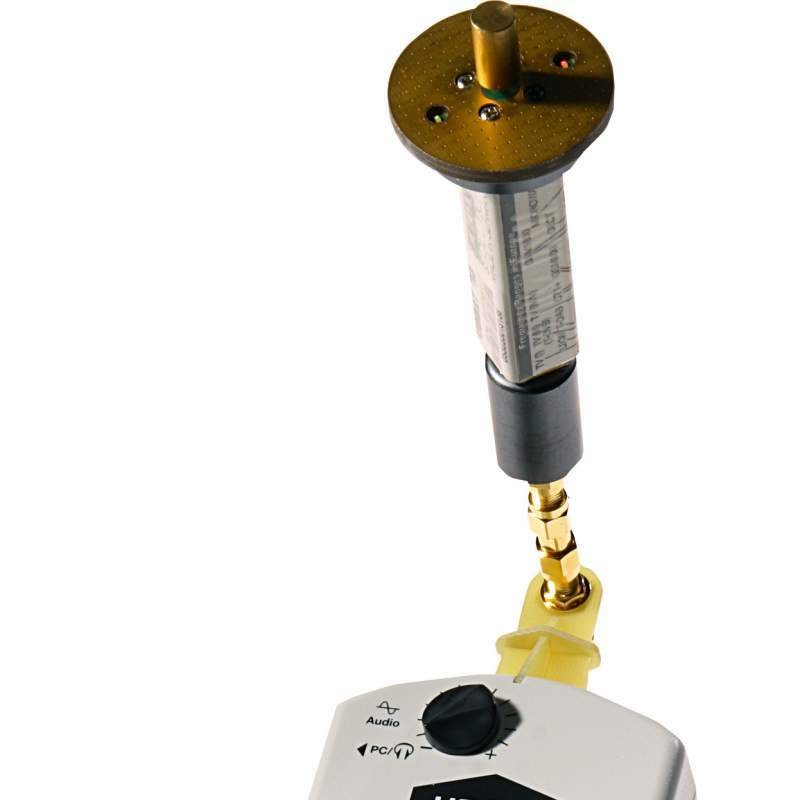 * The actual sensitivity is limited by the device-specific residual noise of the HF-analyser. High-pass filter HP800_G3: The HP800 increases the measuring accuracy when measuring with the log.-per. antenna in combination with the extremely broad band devices HFE35C and HF59B(Filter included in the scope of supply of the HFE59B). Why? The log.-per. antennas are sensitive also for individual frequencies below the specified frequency range. These can be successfully suppressed with the filter, which in turn allows a significantly improved analysis of the measurements with a log.-per. antenna, as the measurements are not impaired by unidentified interference signals. This filter helps suppress the lower frequencies. 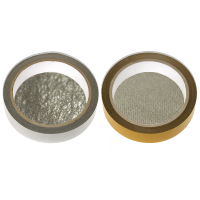 It reaches an attenuation of more than 50 dB (= factor 100,000) below 600 MHz. All Gigahertz analysers specified above 800 MHz already come with a similar filter integrated in the basic device. This integration naturally makes no sense for the HFE-types. Adapter plug to be connected to the antenna input socket. Dimensions: approx. 33 x 27 x 16 cm.